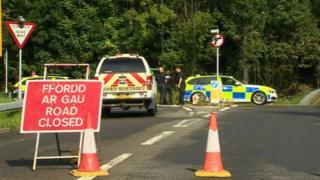 Image caption Police were at the scene investigating the incident on the Heads of the Valleys road for about four hours. A pedestrian has been killed after being hit by a car on the Heads of the Valleys road early on Sunday morning. A man was struck by a grey Ford Mondeo on the A465 at Cefn Coed in Merthyr Tydfil just after 06:00 BST and was declared dead at the scene. The major south Wales road was shut for more than four hours between Cefn and Dowlais Top as South Wales Police investigated the fatal incident. Officers are appealing for people who may have seen the man around that time. The police would also like to hear from anyone who travelled along the road between 05:00 and 06:10. The man's family are being supported by specialist police officers.